Last month I spoke at the Society of Actuaries 2018 Analytics Symposium in Minneapolis. The experience was a delight. Because it was an SOA conference, I had expected that at times I would feel confused or missing critical background, but there were very few instances of this. Several presentations may have meant more to me if had I had more familiarity with variable annuities, but the broad ideas were easy to grasp. For the most part, it was all about modeling. There were even several sessions on using R! During networking events, I felt very comfortable sharing stories about the various kinds of work I had done as a casualty actuary with the life and health attendees. Data science and data scientists were a prominent thread that ran through the symposium. The former was very evident in the content, which ran the gamut from introductory topics like regression through to experimental design and dissemination of results. Data scientists – the profession and presence in various companies – were discussed as part of the current corporate reality in which they and actuaries are breathing the same air. Collaboration and opportunities to synergize and integrate our work as actuaries with data scientists were a frequent talking point. 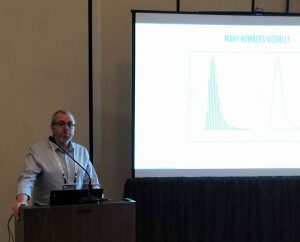 As for my contribution, I participated on a panel about data visualization, with Michael Hoyer FSA at Milliman and Mary Pat Campbell FSA at Conning. This is one of my favorite topics ever, and I was thrilled to have been invited. Michael began with a great introduction to ggplot2, one of the most popular data visualization frameworks for R (which has also been ported to Python). I was up next and spent my time talking about the “Zen” of visualization. Just what does it mean to “see” a number anyway? From this philosophical perch, I explored how we can visualize models and statistical hypotheses just as naturally as we can see a number. Mary Pat brought us home by emphasizing how we can use data to tell our stories. Her talk was filled with great, practical advice about the ways that simple design choices can enhance or obscure a narrative. Though I’ve attended many CAS events, this was my first time at an SOA event, and I’ll admit to feeling a bit nervous when I arrived. It felt like I was crashing a wedding. Of course, there was no need for worry; as I couldn’t have asked for a warmer welcome. It may have been my first event with so many SOA members, but I hope it won’t be my last. Brian Fannin is a research actuary at CAS. He is also the founder of PirateGrunt LLC, a boutique consulting firm based in Durham, North Carolina specializing in predictive modeling in the property casualty markets. Fannin has been an Associate of the CAS since 2002 and a Certified Specialist in Predictive Analytics (CSPA) through The CAS Institute since 2017.